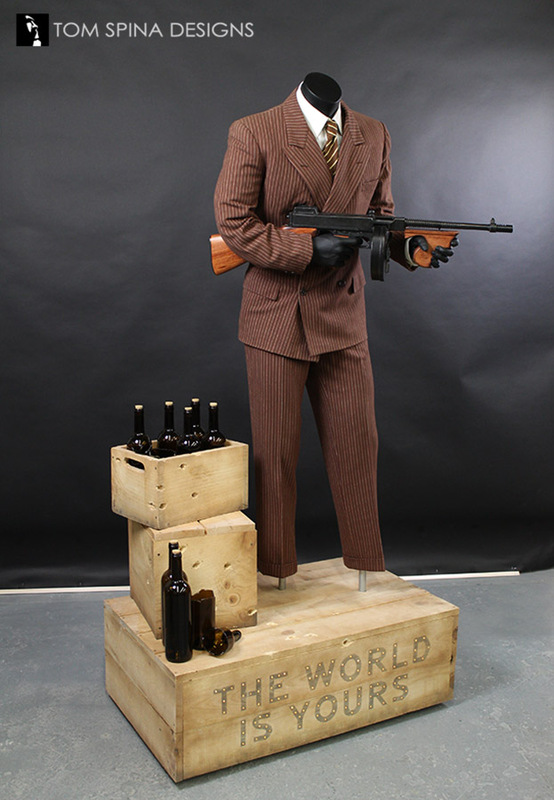 When most people think of Scarface, their first thought s Al Pachino in the classic 1983 film, and his famous line ” Say hello to my little friend”. 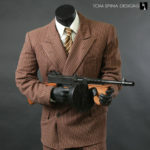 But Al Pachino was not the first, and this Scarface costume is from the original 1932 film. 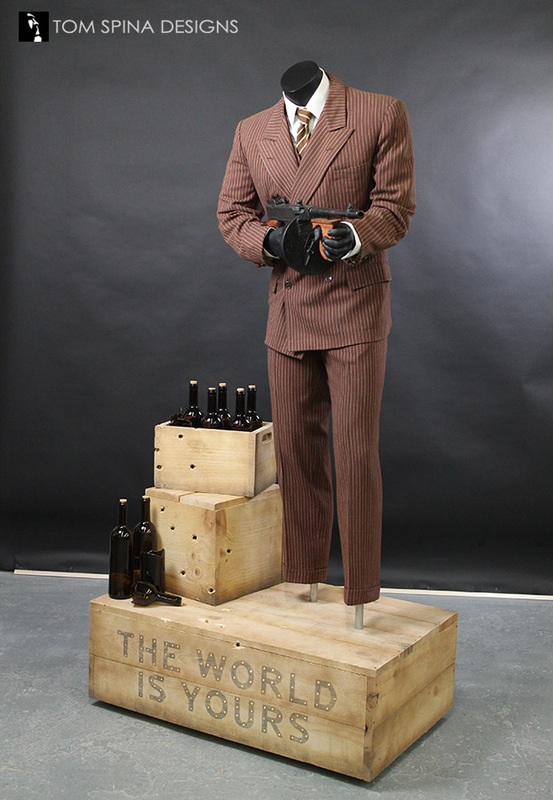 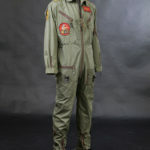 Our client was envisioning a pose where the mannequin could hold a tommy gun as if he is in mid-fight with his enemies. 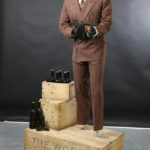 We loved the idea and now it was up to us to bring his vision to life. 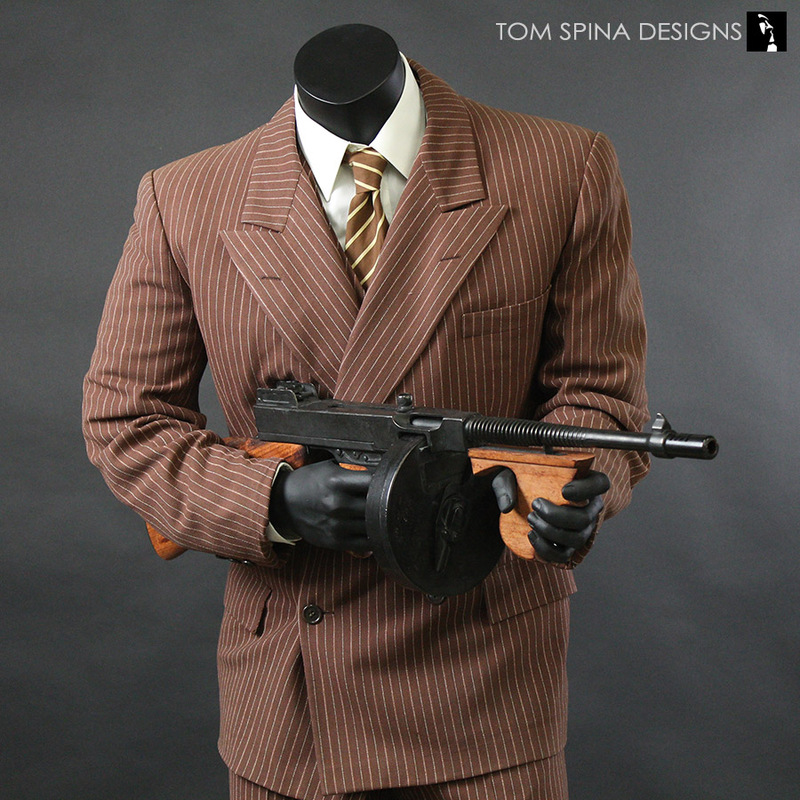 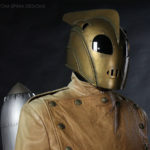 This project was definitely a balancing act because we needed to make sure that the suit fit properly on the mannequin but also that the mannequin could support the weight of the heavy replica tommy gun (which, though it was a solid dummy gun, was actually made from metal and wood!). 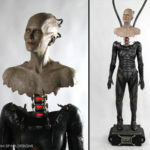 While a headless, all-black mannequin may seem like a simple display, for a figure like this, it’s actually a very complicated process which needs to be carefully planned. 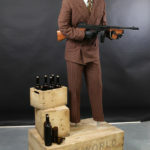 To compliment the figure, we went with a stack of prohibition style crates which were all custom made by Steven Richter. 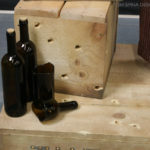 Once the pristine crates were finished he distressed them so that the looked like they had been used and around for years. 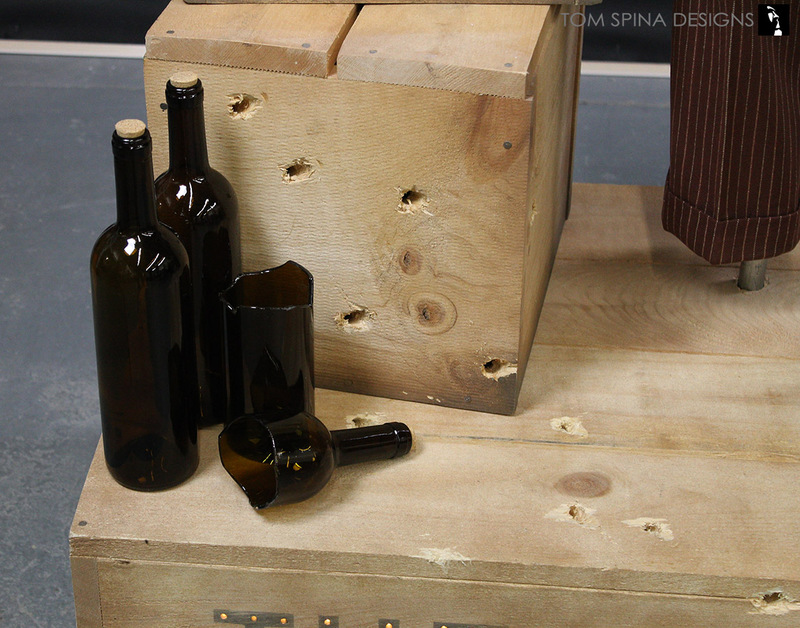 He added a slew of gun shot holes and several liquor bottles some of which were shattered (but sanded down for the safety of out client). 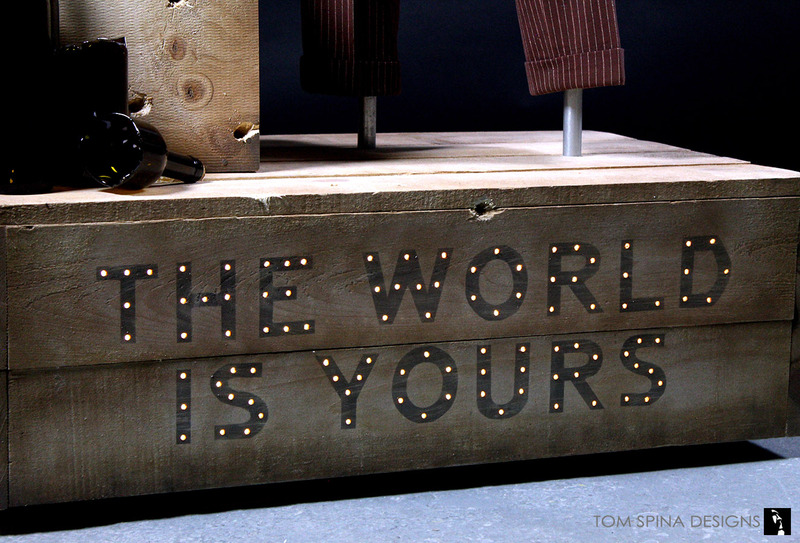 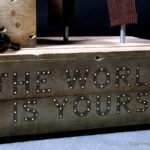 The front of the base also features the slogan “the world is yours” in a lit up style which mimics a billboard that plays an important part in the film. 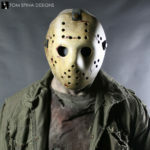 Say hello to Al's other friend! 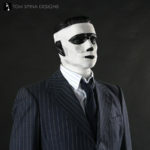 Download the original Scarface here!